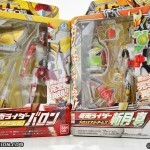 DX Messiah Lock Seed And Savior Arrow Set Revealed! The hits from Premium Bandai just keep coming tonight! We have one more item to our list of reveals: with a new web page featuring the DX Messiah Lock Seed and Savior Arrow Set. Both items belong to Kamen Rider Savior, the villain of the Gaim Gaiden Duke and Knuckle V-Cineama. The Savior Arrow is a black repaint of the Sonic Arrow, so this will provide late comers the perfect opportunity to experience the toy if they’ve missed out the first time around. 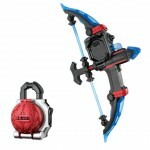 The DX Messiah Lock Seed itself is a red redeco of the Sukia Lock Seed with a new interior sticker featuring the Savior Arrow. Preorders for this set will be made avalaible August 7th 2015 and will close on September 10th with a final shipping date of sometime in November 2015. The DX Messiah Lock Seed and Savior Arrow set retails for 5,616 yen before middleman fees. Rounding out tonight’s dump of official images from Bandai are the DX & roleplay items coming in December from Kamen Rider Drive! First up is the Movie War Full Throttle set containing the Type Fruits Shift Car & Drive Lock Seed. This 2-pack will be released on December 13th for 2592 yen ahead of the December 25th release date for the Tire Koukan & Arms Change Figures for the same movie. Next is Drive Type Technique’s soon to be trademark weapon, the DX Door Gun. This upcoming roleplay weapon also includes the Shift Car for Drive’s next form, Type Technique! The Door Gun will be released on December 6th for 4104 yen. And rounding things out is another Shift Car two-pack. 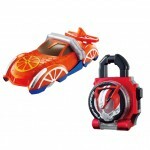 This two-pack contains the Fire Braver & Rolling Gravity Shift Cars set to appear in the December episodes of Drive. This set will be released on December 6th as well, for 1512 yen. 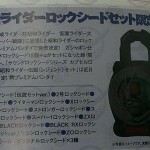 Two of the three mystery lock seeds in the big Premium Bandai Showa Rider Lock Seed set have been revealed through magazine scans. We’ve known about Shadow Moon now for some time, but this new one might come as an unexpected shock to a few folks with a Seed to represent Shocker’s Great Leader. What’s more, the magazine scan previews the inside artwork for both Lock Seeds. “BAKAMON! Haji o shiri nasai! NEVER GIVE UP!! !” Even though the series is over, Gaim continues to produce its merchandise through Premium Bandai. 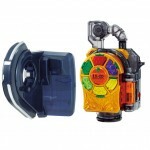 The latest release from this past weekend, is the Premium Bandai Gashapon Lockseed Donguri (Oren Voice Version) and Darkness Lockseed set. The Donguri (Oren Voice Version) Lockseed, otherwise known to some as the Fake Donguri Lockseed, made its debut in Episode 17, bringing some comedy relief to a serious situation in that episode. Created by Oren Pierre Alfonzo, otherwise known as Kamen Rider Bravo, the Lockseed was used by his protégé, Hideyasu Jonouchi, otherwise known as Kamen Rider Gridon. 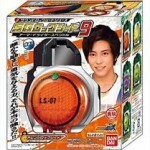 The Darkness Lockseed set consists of the Dark Orange and Dark Lemon Energy Lockseeds. These two Lockseeds make their debut in Gaim’s Summer movie, “Great Soccer Battle! Golden Fruits Cup!” used by the brainwashed Kouta Kazuraba, aka the titular Kamen Rider Gaim, to transform into the evil Gaim-Yami. Note that this set is a Gashapon style set, meaning they lack the LED and springloaded action that DX Lockseeds do, and that they need to have their back button repeatedly hit to make the sounds. Though this set was released this past weekend, another batch of it was up for preorder up until September 17th, with an expected release date for that batch being November 2014. 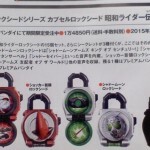 Yet another set of Premium Bandai exclusive Lock Seeds are about to open up for pre order, this set contains the Dark Orange and Dark Lemon Energy Lock Seeds used by Dark Gaim from the summer movie. More uniquely, this set appears to be the only way to get the Gashapon Fake Donguri/Acorn Seed used by Oren in Episode 17 of the series. Of course, the seed will contain unique lines pre recorded by Mister Dangerous himself. Pre Orders will end September 17th and will ship out November 11th, the set retails for the surprisingly affordable 2,592 yen. Bandai isn’t done with Kamen Rider Gaim quite yet! It seems we’ll still be getting Lock Seeds well into Drive’s Premiere! The Rider Lock Seeds will be continuing, featuring characters from Ichigo to J. There’s currently no word on when these new Seeds will be coming out, but the Showa lock Seed from the Movie Taisen set should give you an idea of what to expect. Sound Lock Series SG Lock Seed 9 Video Demo! k2eizo has a juicy new Gaim video for us: taking a look at the Capsule Lock Seed series 9, containing Orange, Banana, Grape, Melon, and Durian! You might be thinking “Didn’t we get those already?” and yes, we did however the fresh twist here is that these Locks contain phrases recorded from their respective actors designed to work intandom with the pre-existing sounds, much like the Phillip and Shotaro Gaia Memory from W. The neat thing is that while in the Sengoku Driver, you’ll get extra phrases instead of the usual Au lait, Sparking, and Squash sounds. If you aren’t caught up yet on Kamen Rider Gaim episodes then trust us, now is the time. If you are then be sure to head over to our Episode 32 “The Strongest Power, Kiwami Arms” discussion thread. Because this week Kamen Rider Gaim Kiwami Arms makes his powerful debut! 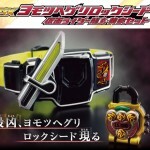 On that topic Bandai Of Japan has also just released official images of the DX Kiwami Lock Seed/Key set. This set includes the Kiwami Lock/Key and the Senyo Joint adapter which replaces the rider indicator faceplate. When inserted through the joint and turned, the key reveals the secondary faceplate of the Kachidoki Lock Seed and a new plate on the Kiwami folds down as well. This set is priced at 2500 yen. Another larger pack including Kiwami, the Joint, and the Kachidoki Lock Seed will also be released concurrently with the standard Kiwami & Joint set. This larger set is priced at 4500 yen.